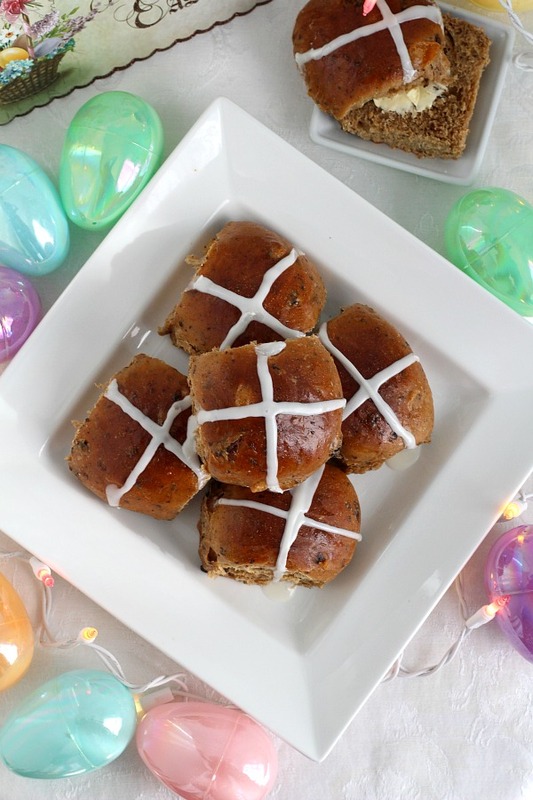 Hot Cross Buns are an Easter tradition and a lovely, sweet breakfast treat. Dough is made easily in a bread machine then shaped and baked in a dish. Frosting is piped on top in the shape of a cross. 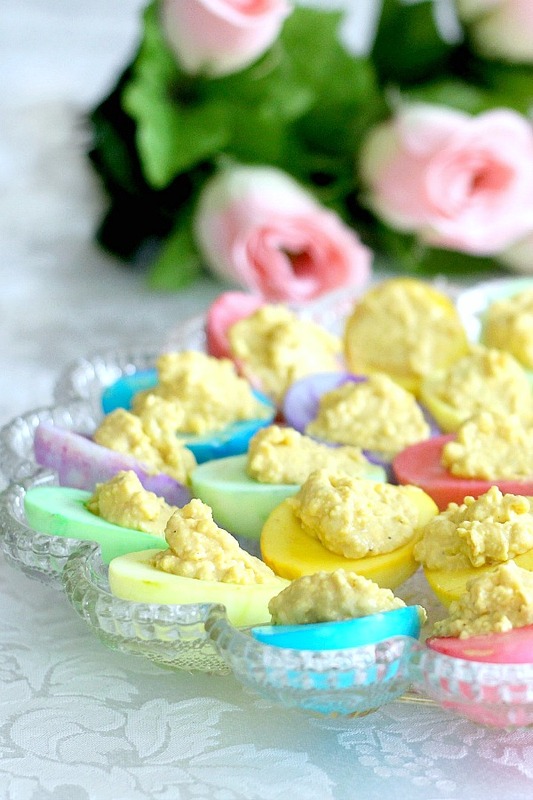 A perfect addition for brunch with hard-boiled, colored eggs. 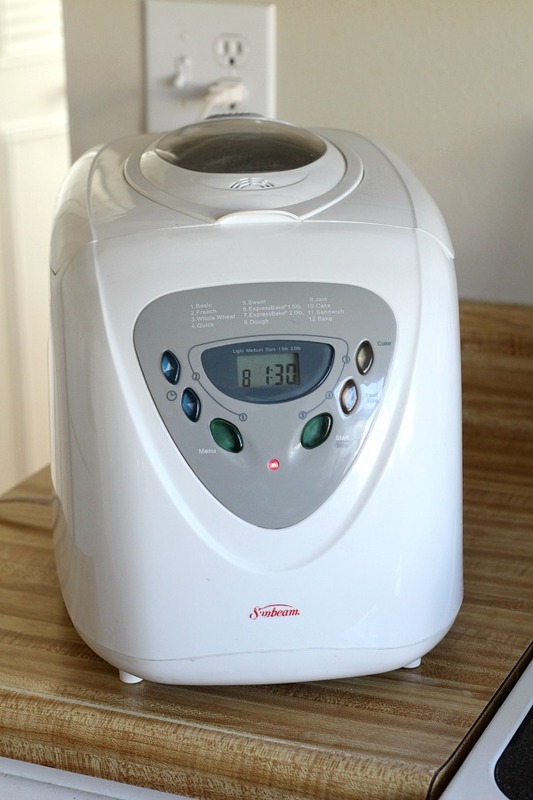 If you don’t use a bread machine you can make them using a stand mixer. 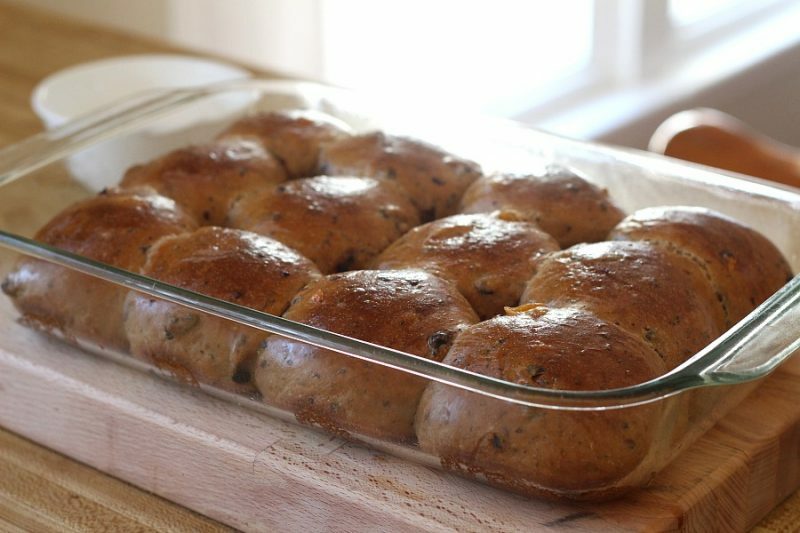 Hot cross buns are filled with dried fruit and flavored with cinnamon, nutmeg and cloves. 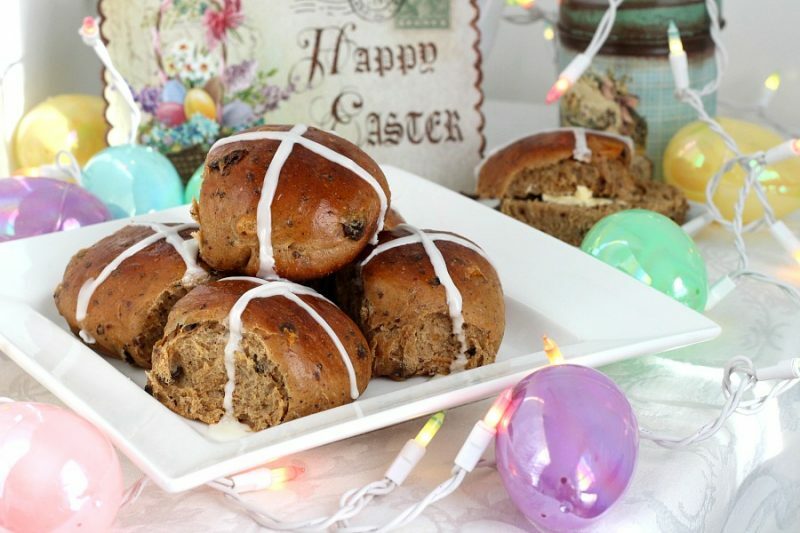 Traditional Hot Cross Buns do not have the frosting piped on top but rather a flour/water mixture that bakes into the top of the bun and then glazed. Though not technically traditional they are really tasty! 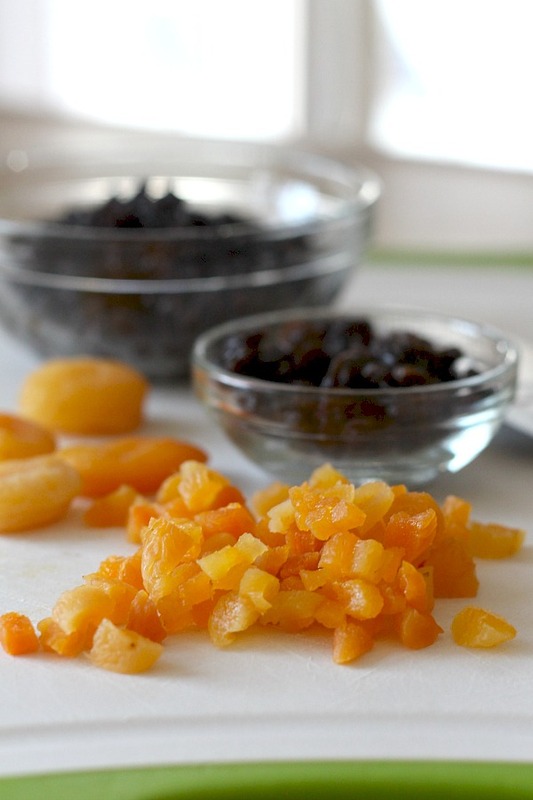 In addition to the traditional currents, I add golden raisins and apricots. 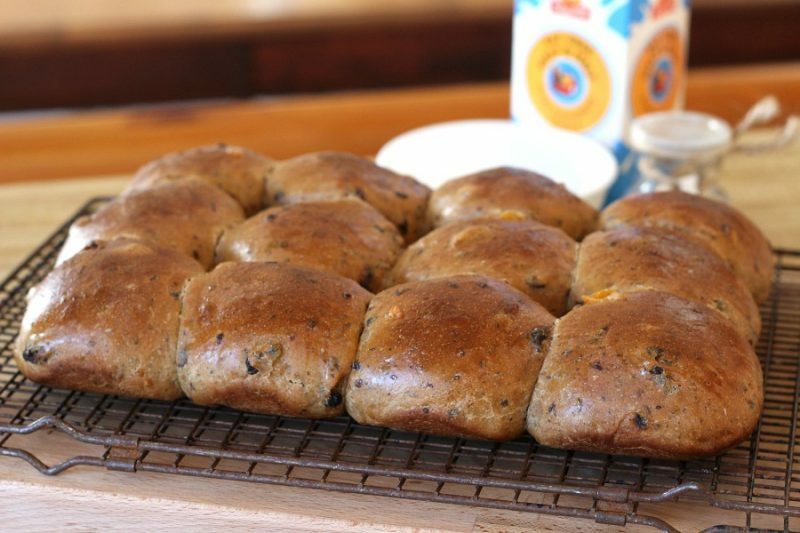 It takes just a few minutes to add the ingredients to the bread machine pan and in an hour and a half the beautiful dough is ready. Using a knife or dough scraper, divide dough into 12 portions. Try and make the portions of equal size. You can eyeball it or use a kitchen scale to be exact. 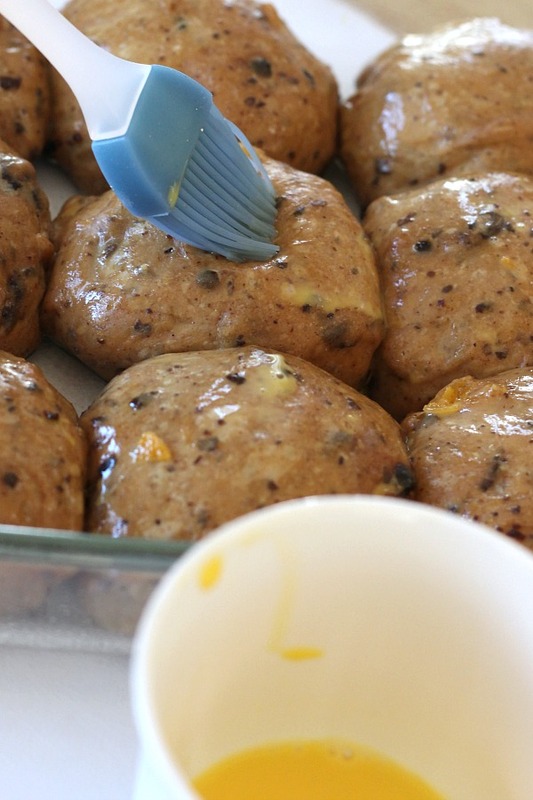 Place the dough balls into a lightly sprayed baking dish. 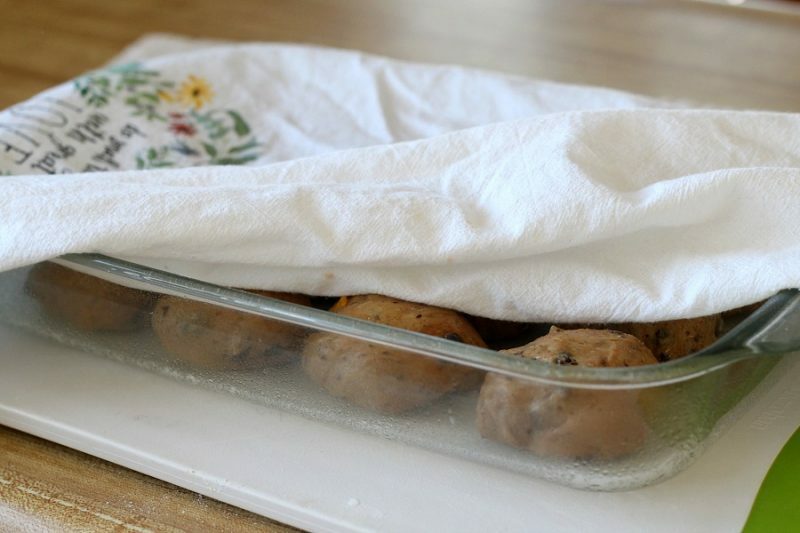 Cover with a clean towel; place in a warm, draft-free place and allow to rise. After rising, gently brush the tops with an egg wash. Here are the Hot Cross Buns right out of the oven. Immediately remove from pan onto a cooking rack. 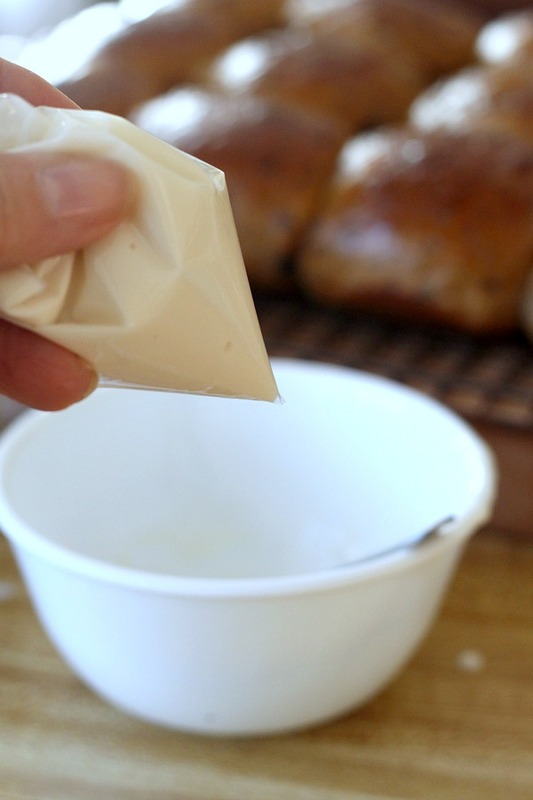 Make the frosting for the crosses and pour into a small plastic bag. 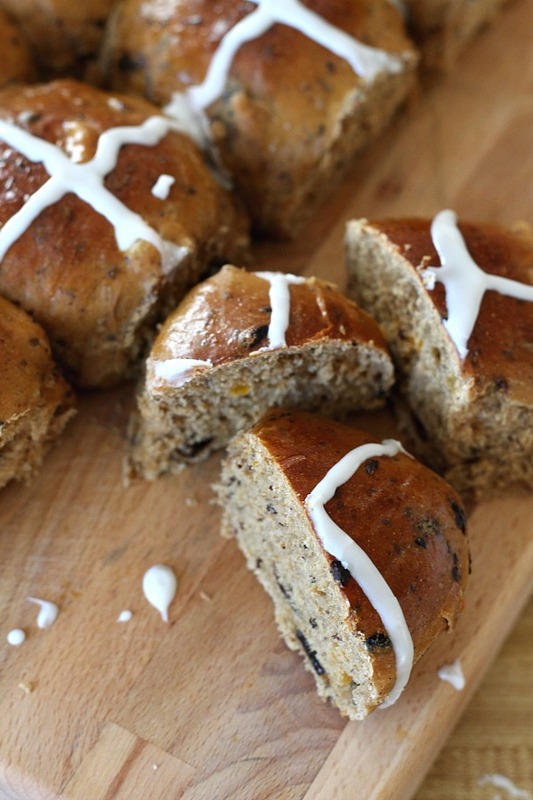 Cut a small opening in the corner of the bag and pipe crosses on each cooled Hot Cross Bun. 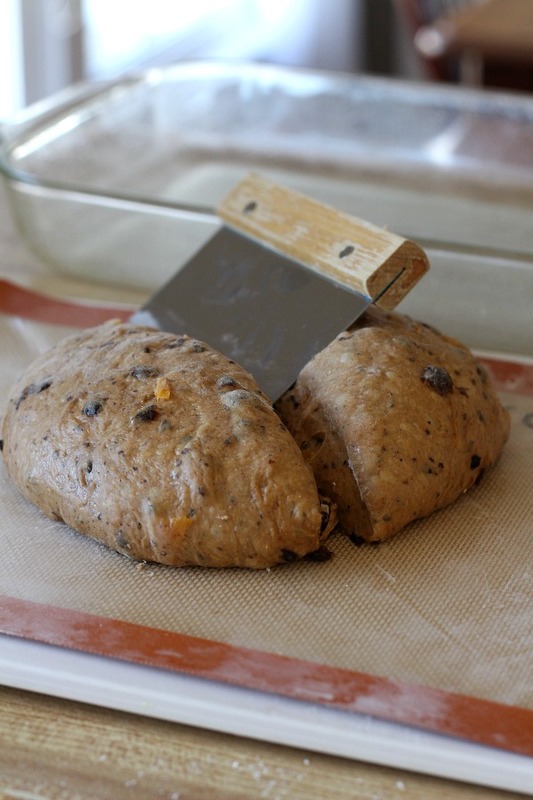 When 5 minutes of kneading are left, add currants, raisins, apricots and cinnamon. Leave in machine till double. Punch down on a lightly oiled* surface, cover, and let rest 10 minutes. 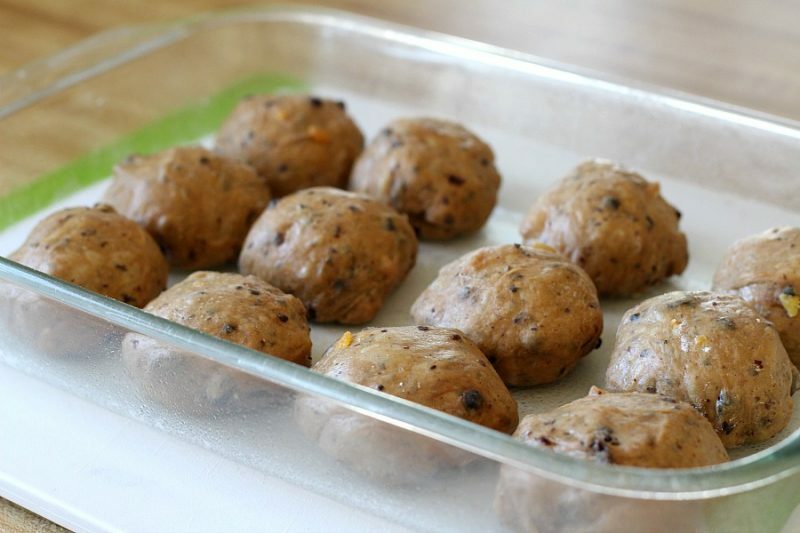 Shape into 12 balls and place in a greased 9×12-inch pan. Cover and let rise in a warm place till double, about 35-40 minutes. To make crosses: mix together confectioners’ sugar, vanilla, and milk. Brush a cross on each cooled bun. Using a stand mixer, combine warm water and yeast in the bowl of the mixer and let soften for about 5 minutes. Add flour, milk powder, sugar, salt, egg, and egg white. Mix on low speed using the dough hook, scraping the dough down occasionally, for 10 minutes. Add the softened butter, cinnamon, and currants and mix for an additional 5 minutes. Transfer the dough to a greased bowl, cover it with plastic wrap and a kitchen towel, and allow it to rise until doubled, about 1 hour. Place the dough onto a lightly oiled* surface and punch down; cover, and let rest 10 minutes. 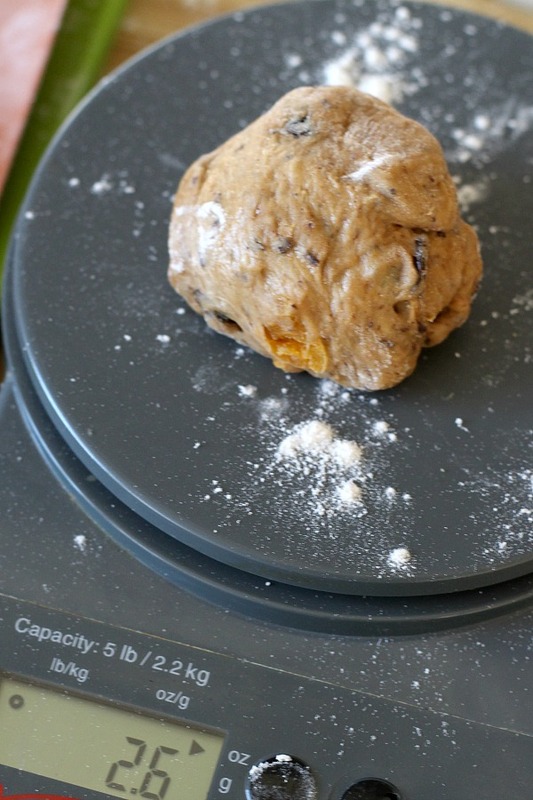 Shape the dough into 12 balls and place in a greased 9×12-inch pan. Cover and let rise in a warm place till double, about 35-40 minutes. Bake at 375 degrees F for 20 minutes. Remove from pan immediately and cool on wire rack. * I work and shape the bread dough on a lightly oiled surface and find little sticking. If you prefer, work on a lightly floured surface.